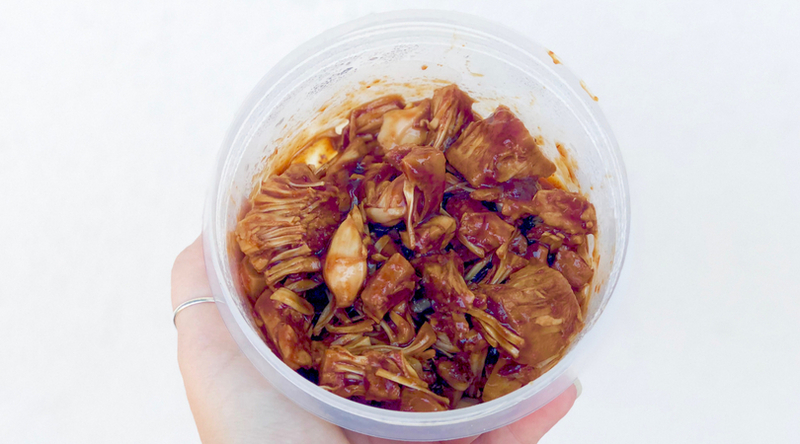 Have you experienced the awesomeness of Jackfruit? I used it for the first time last year to make vegan tacos. I was so pleasantly surprised and have been pretty obsessed with it since. Jackfruit is found in the rainforests. It is popular in India, south east Asia, the Philippines, and Brazil. 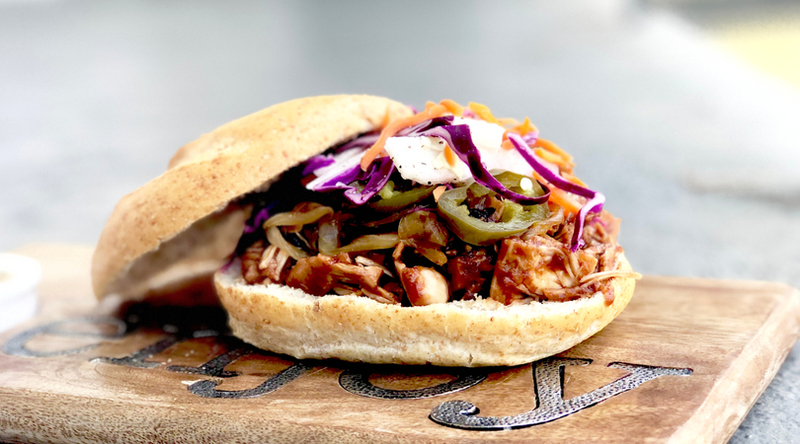 The texture is similar to pulled pork, which is why it’s become so popular in vegan dishes. It takes on flavor really well, too! The taste of raw jackfruit is mild; It reminded me of artichoke heart. I’ve been really into big, mixed flavors lately. So, when I was thinking of the perfect vegetarian sandwich, I wanted to infuse layered flavor. This is what I came up with and I hope you love it as much as I do! On medium heat, boil jackfruit in one cup of water or vegetable stock for 20 minutes– allowing it to absorb all liquid and adding more if needed. Jackfruit will be tender and tear easily when cooked. If over cooked, it will become tough. In the original pot, after it has boiled, shred with a fork and coat with BBQ sauce. Place on cookie sheet and cook in oven on 400 degrees for another 10-15 minutes. Remove from oven and add more BBQ sauce. I like mine really saucy, but you may not. So add your desired amount. Add your sliced onions to a dry pan (or deglaze with EVOO) and sprinkle with salt. With a spatula, stir to make sure onions are coated. 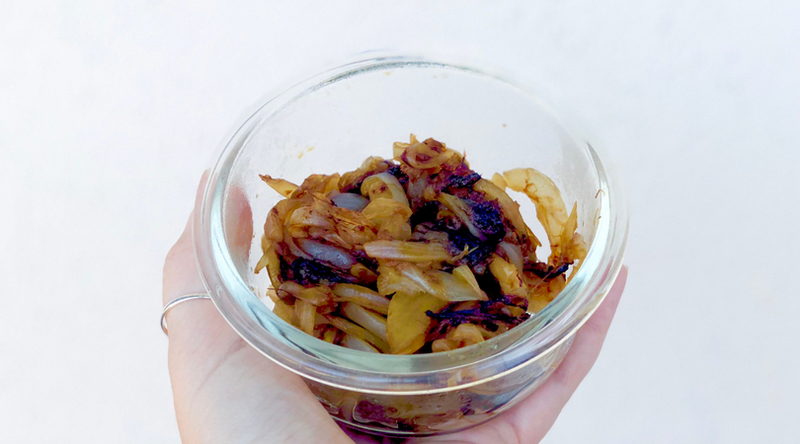 The key to caramelizing an onion is doing it slowly. Keep the heat low, stirring every so often so that they don’t burn. (If you stir too often, they won’t brown) Cooking them slowly allows the natural sugars to come out of the onion and give them that deep brown coloring. Caramelization may take up to 30 minutes. If you notice the onions burning, add a little water. The picking process is actually quite easy. Combine 3/4 cup water, 2 TBSP sugar, 1 TBSP salt, 1 clove of minced garlic, 1/2 cup white vinegar, and 10 jalapeno rings in a pot. Bring to a boil. Once jalapeños turn bright green, they are done. 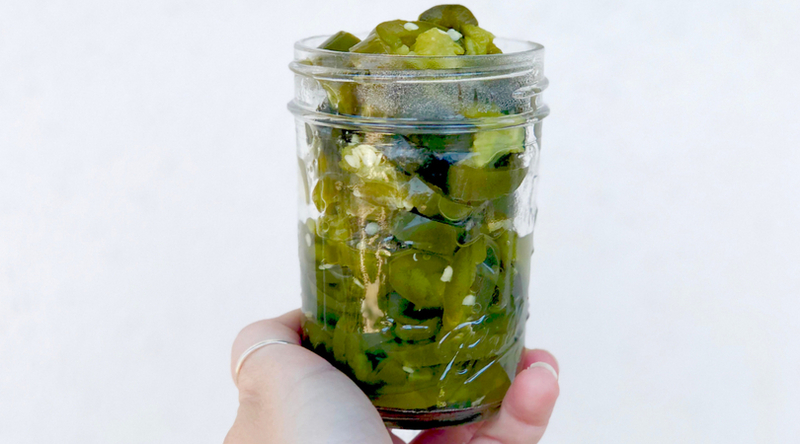 Let cool for 10 minutes and then transfer jalapeños and the pickling liquid into a mason jar. Store in refrigerator. 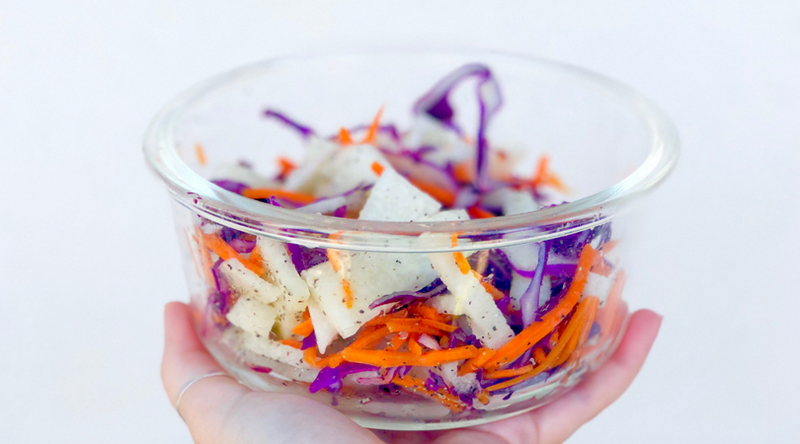 For this slaw I’m using red cabbage, carrots, and jicama. Lightly toss in fresh lemon juice, salt, pepper, and a pinch of cayenne pepper. This adds a great crunch to an overall soft sandwich. 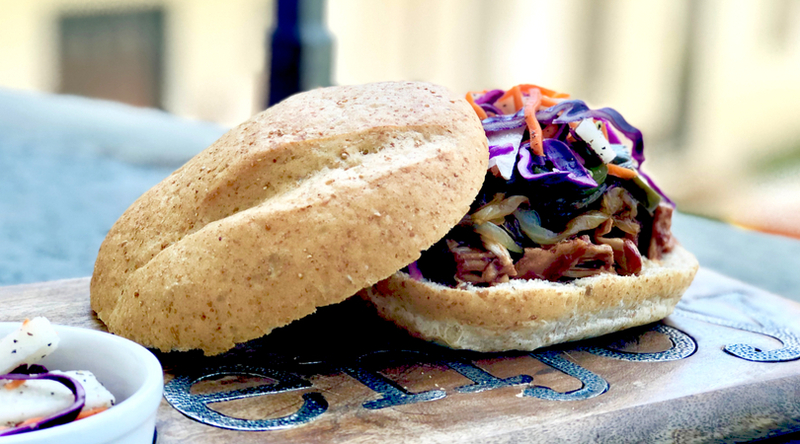 Using your favorite type of bread or roll, put two tongs worth of the bbq jackfruit on one half. 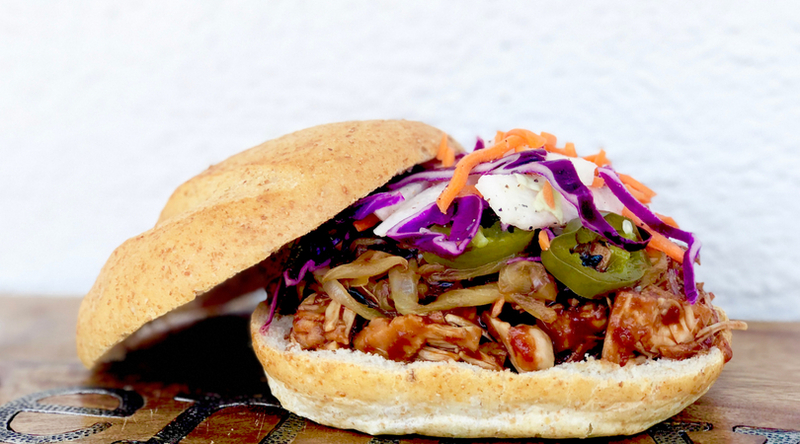 Top with caramelized onions, pickled jalapeños, and raw slaw. Top with the other half of bread or roll. Don’t want to indulge in carbs? Serve everything over a bed of lettuce for a low-carb lunch or dinner! It may not seem like a meal prep friendly recipe, but because you can store all of the cooked ingredients separately, you can make sandwiches or salads for the week pretty easily!